Team building activities are one of the key factors in the success of a company. The more time co-workers spend together, reflects directly on the success of a project. We at the Silver Springs Moran Hotel in Cork recognise this and recently took part in what can only be describe as the most premium of team building day’s offered at the National Maritime College of Ireland (NMCI), who have the world’s most advanced maritime facilities! A typical Team Building day at NMCI could involve a navigational race around Governors Island in New York Harbour, in one of the College’s cutting-edge bridge simulators. 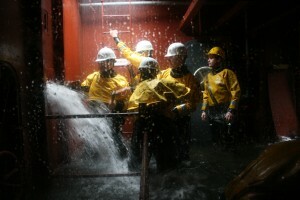 A repair exercise set in a rapidly flooding chamber in the Damage Repair Instructional Unit (DRIU). 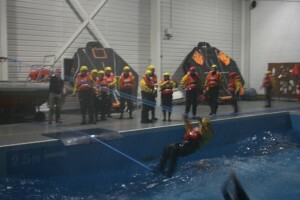 Followed by, a range of sea survival challenges in the environmental pool with harsh weather condition at their max. There are over 10 different challenges that you can choose from when tailoring your team building day and each task can be run in 3 separate difficulty levels, and the intensity and competitiveness of the exercises will be dictated by the robustness of your group. The NMCI provide Team Building courses to suit their clients from a range of different areas of industry, so if you have a new team that needs gelling or just want a fun day out like we at the Silver Springs Moran Hotel in Cork did, why not find out what they can do by visiting the NMCI website to view their full list of Team Building Activities.